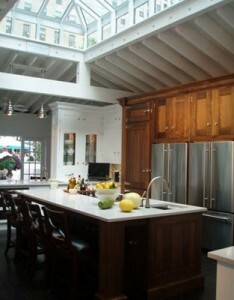 The winner of the 2010 Kitchen of the Year contest was designed by Jeff Lewis, star of Bravo Network’s show Flipping Out. His winning design features a simple open layout, a cozy area for socializing, and loads of high-tech extras. This winning design is the most modern winner in recent years. It’s a contemporary looks, and efinitely the focus is on the kitchen organization, island, appliances, storeage areas and cool extras. For example, the great KraftMaid wine rack, or the high tech CeasarStone island. 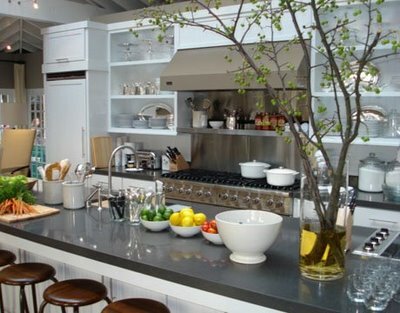 The 2009 Kitchen of the Year was a beautiful and functional, but familiar kitchen design from Ina Garten. We’ve all seen it on TV. Designed by Ina Garten, it is twin for the dream kitchen she built in her barn. It was a suprise to some people who felt that an original design should be the highlight of the show, instead of something everyone had seen previously, no matter how terrific it was. 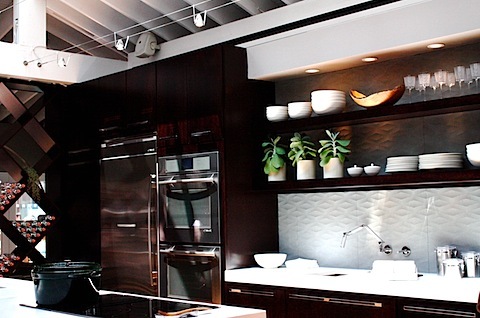 Kitchen designer Christopher Peacock created the winning entry in the 2008 contest from House Beautiful. It’s a large kitchen with a very familiar feel to it. The painted wooden ceiling beams and dark wood floor dictate the feel of this design. That feel was prefectly embellished by his use of white painted, glass front wooden cabinets, both painted and stained, and a charming open plate rack on the left side. The 2007 winner was designed by interior designer Alinda Morris. It features a lot of great environmentally friendly features. 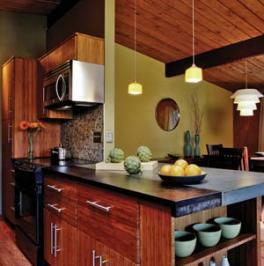 The cabinets are made from bamboo, with a coating that allows for washing with soap and water. Yes they are custom made to fit into this smallish space. Small appliances, small cabinets, small everything forced Alinda to consider every square inch carefully in this wonderful kitchen design. See the cool countertops? Alinda got this material from the Environmental Home Center in Seattle. It’s PaperStone Certified, made from 100% post-consumer paper and cashew-nut resin. It’s recycled, earth friendly material, yet it’s heat resistant and waterproof. Again a very cool choice.